I remember that when we were at Malcolm’s hotel we were all sleeping in a nice room and Jordi was sleeping in the front seat of the caravan. Jordi, because he was unhappy with this and pissed off, at 7 o’clock in the morning he starts in the car park vroooooomm wheelie vrooooooomm wheelie… so Jordi, I think he has the chance that I don’t have. I have my progressions stop because of the Montesa problem and Jordi has the good ramp to go ahead. Pedro made a lot for Jordi. They no give a lot to Jordi and no give him luxury not at all. The good thing is that mentally Pedro teaches Jordi that you have less but you have to demonstrate to them that you have more. ok ….so …..for example, we were eating in a nice restaurant and Jordi was sitting in van making spaghetti on the heater. He would say “Oh I just eat beautiful spaghetti “. To use we can see that he likes to convince us that he was eating very well. It like mentally he has to show that he was better than us. Do you think that he was taught to do this? Yes, yes….. actually for example one of the tricks that Jordi starts, we were arriving on the Friday at the trials and he was arriving on the Tuesday before so he starts to practise some sections and when we arrive he say “I have very nice section” and he was cleaning this already because they have done this many times before so he was psychologically affecting us. That was very strong with Jordi. 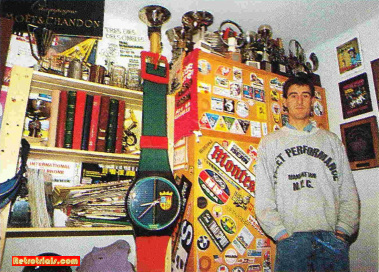 Jordi has a very strong mental because he was teached by Pedro. He was teached these techniques. You have to be better but also make them worse. It makes sense. At the time you had a successful career. 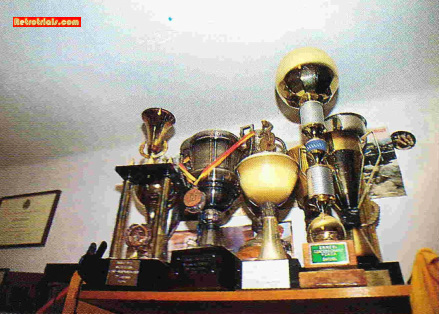 What made Jordi push through and be a successful as he was? Berlatier for example was having a very good momentum and in 85, 86 and 87 he never get through because he was no good in there. He would get angry, yes yes yes. He loses his temper. Same thing with Diego. 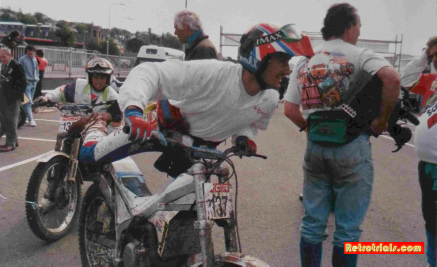 Diego was a very big talent, much better than Jordi some time, but he was not able to, first of all setting the bike up properly. Diego was riding with anything. If you put a different jetting he would not notice anything, just go. Jordi was very good setting the bike. Berlatier the same, nothing in the brain, just go. Some riders …….the champion is the consolidation of a few factors and Jordi and Dougie have the best consolidation of all of the factors. 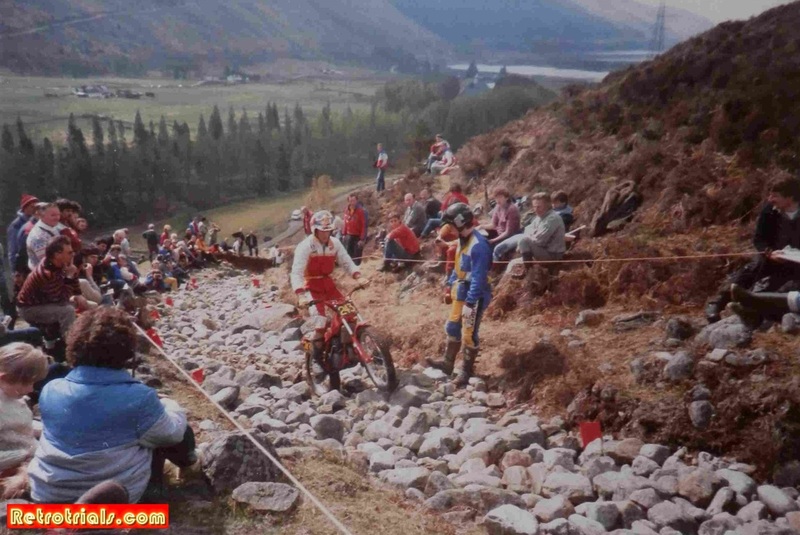 How many times have you ridden the Scottish Six Days Trial? 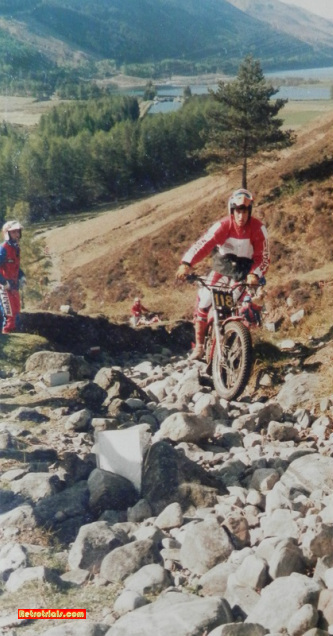 I’m not sure how many times but I think it’s about 15 times.The first time was on the Montesa back in 1984. This was the first year with the tubeless. I have a good story with this Scottish. 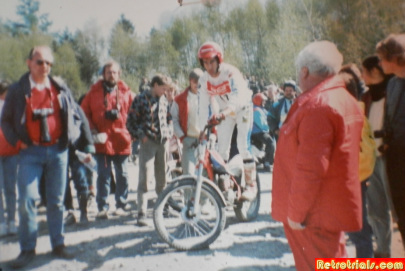 The 2nd year 1985 because the first year I have the problem with the spokes but 2nd year everything was solved and I say to my mechanics, my mechanics from Montesa. I was the little kid and back at the factory I would have to bring a bottle of cognac to the mechanics they will make me special tools and give me special parts. 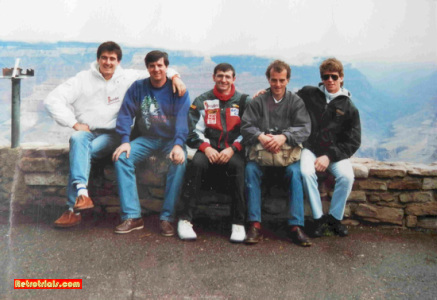 So I say to Antonio one of the mechanics there “Antonio in Scotland there is a lot of road. Do you think you can make a special gearing so I can go a little faster on the road?” he said “Oh yeah, no problem but bring me a bottle of cognac and I will make you the best engine”. He made me a special gearing with the enduro gears for the 5th and the 6th year, so I didn’t try it because in Spain everything is like the last moment. We were ready to go and the engine was still being made so when I get to Scotland I start the engine I go on the road. I think I am going to try 1st gear vroooooom, 2nd gear vroooooomm, 3rd gear vroooooom, 4th gear vrooooommmm revving well , 5 th gear vroooooommmmmm revving really well , 6th gear broooooooooommmmm , very low rev ….then revs increase and this bike makes crazy speed, amazing speed on the road . It was going 130km per hour. 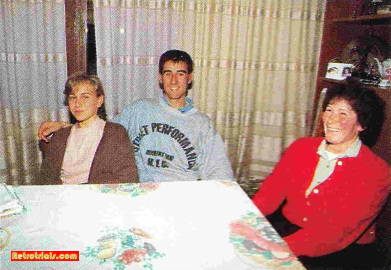 Here are some rare photos of Andreu at his family home with his Mother and Sister . The tyres every day I needed new because they disintergrated, on the 4th day I have to retire because one of the pinions break and makes a hole in the engine like this ha ha ha ha. This was big problem. On that day I was going from last section to the finish and I was on the last mile and I have someone putting me on the van. When I get to the finish Sandiford was very angry with me, because I retired. He said “You should never retire, we can look at repair”. I did not think this as I was young, but it was too late. I983 my Montesa had 3 spoke wheels. 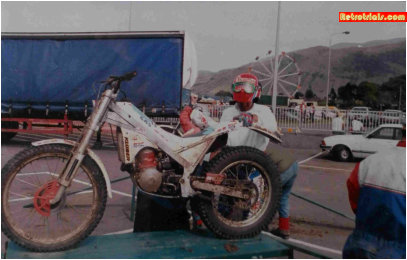 I still remember the first year with the water cooled Gasgas in 1990 we have a lot of problems with this bike and the water cooling. This was the prototype. I make a hole in the cylinder head. I broke the radiator and there was no water, these bikes were not ready for the Scottish. 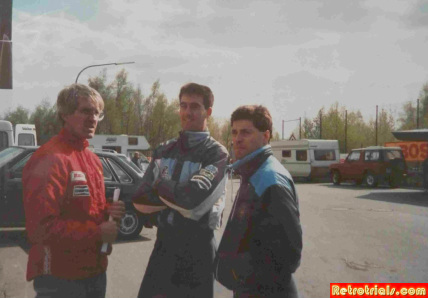 Who was your minder at the World Trial? I have a Japanese minder for a while but never get a real minder. I had someone who was carrying the tools but not a real minder. 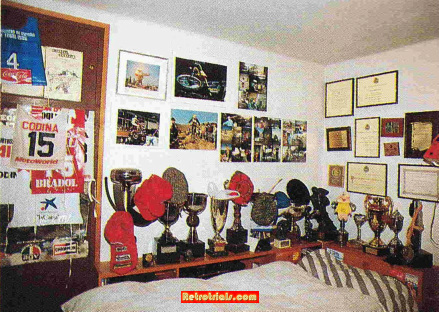 What was the favourite bike of career? 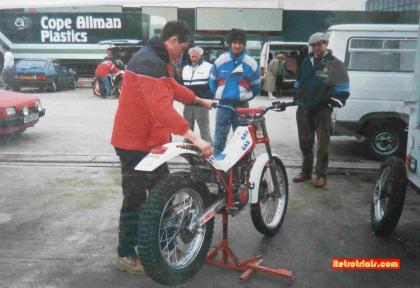 The 1987 Gasgas Halley. The production bike was not reed valve but my bike had reed valve and a dellorto 26mm which make it much much more power. Manuel Casada has this bike. The 92 Gasgas was very good, the first red one. When did finish riding career? 1992. 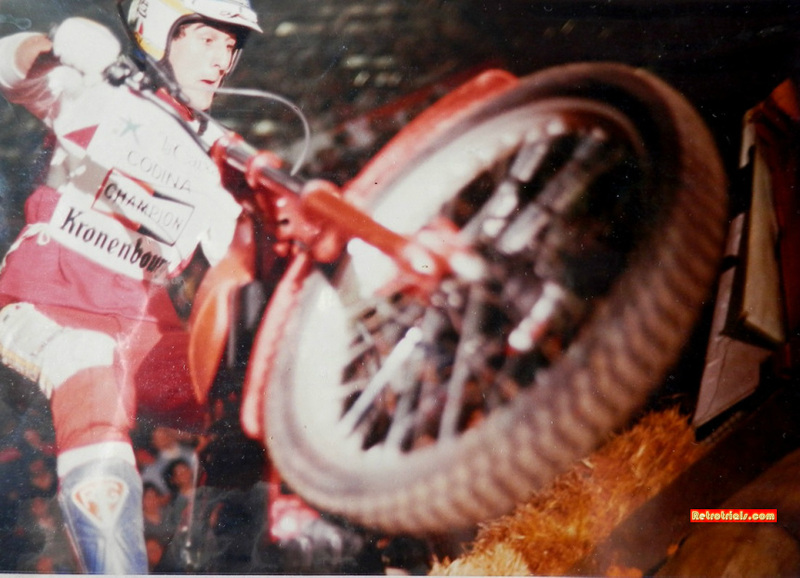 In 1990 I stopped riding the World Championship and 1991 and 1992 I just make some of them. Favourite country to ride in? 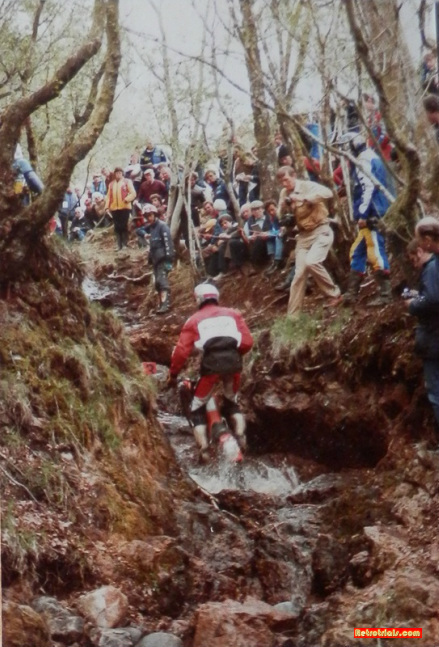 Italian world trials were always nice. There was a good atmosphere, a super atmosphere, very hot. Some Spanish trials were good but I still have good memories of the Italian. French were good but France is different because the French people, the French were good, but sometimes the trials were, the observers were against you. The French were doing a lot of tricks against the Spanish riders. I don’t know if it was jealousy but it was fight between the French and the Spanish riders. Favourite trial ever? 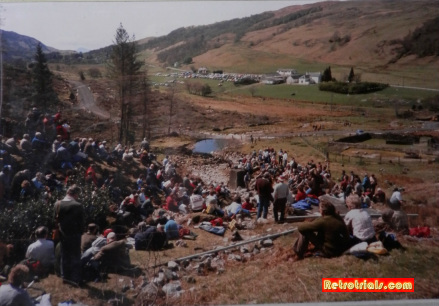 What was the most memorable trial that you have ever ridden? For me the best memories are winning the Barcelona Indoor stadium trials because it’s home, it was 10,000 people there. 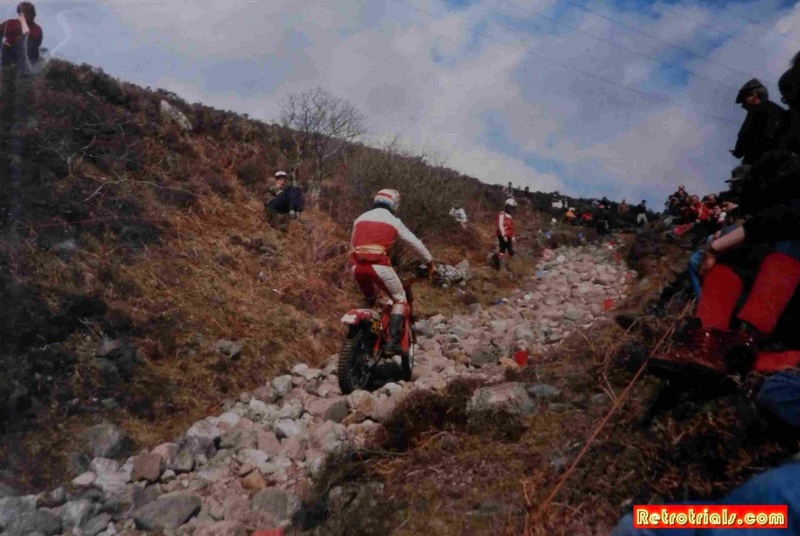 It was my best place, 1985 on the Montesa.